Cancer is a difficult subject to talk about. It is invasive, draining and life changing and most everyone personally knows someone who has been affected. However, fear of the disease cannot dissuade from important conversations about risk, prevention, and next steps. The fact of the matter is cancer is a disease of the aging. “The cumulative risk for all cancers combined increases with age, up to age 70” with about 50 percent of cancer cases found in those 65 and older. That number is expected to increase to 70 percent by 2030 as illnesses that formerly caused death at a young age gain better treatments or are cured altogether, meaning people are living well into their 70s, 80s and 90s. But age does not mean you have to be submissive to an eventual cancer diagnosis. Chances of cancer are much lower if you live a proactive, healthy lifestyle. What you’ve heard is true; consistent exercise, avoiding heavy alcohol consumption, and limiting your intake of red meats do reduce the risk of cancer diagnosis. Prevention is key! It is important to maintain those good habits as a senior for the benefit to your overall health, however, you should also be aware of the life you led in your younger years and how that may be affecting your health today. For example, if you smoked as a young adult before realizing the unhealthy side effects, your chance of lung cancer may be higher than non-smokers’ as it is estimated that 45% of those diagnosed were former smokers. Similarly, you should be aware of any past workplace exposure to hazardous chemicals. According to the CDC, “Based on well-documented association between occupational exposures and cancer, it has been estimated that 3-6% of all cancers worldwide are caused by exposures to carcinogens in the workplace,” which equates to between 45 and 90 thousand new cancer cases each year. One such environmental toxin is asbestos. A natural mineral and known carcinogen, asbestos exposure is the cause about 80 percent of mesothelioma cancer cases. The material was used in the many industrial jobs until limited regulations were put in place throughout the 1970s and 80s. 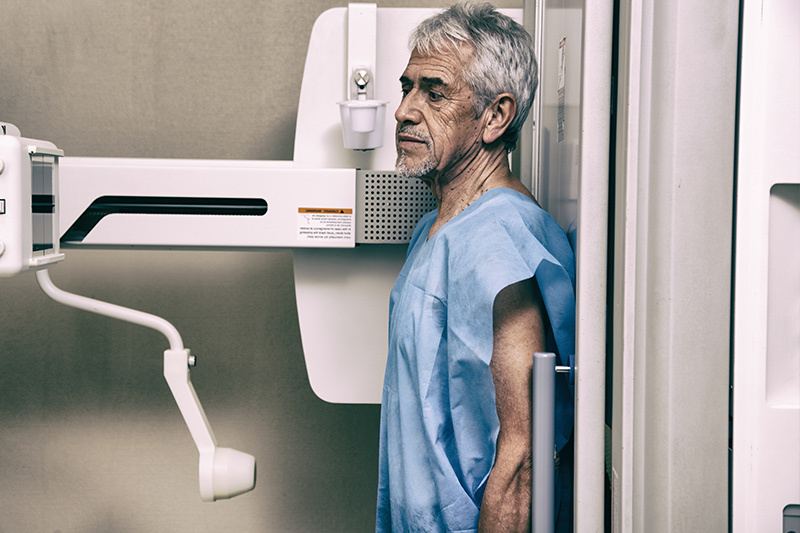 It may seem unlikely that you will ever need to know this information, however, it is especially important for aging men to understand the risks associated with mesothelioma. Through much of the 20th century the material asbestos was used in thousands of products from insulation and brake pads to clothing and kitchen appliances for its incredible heat and fire resistant properties. However the connections between asbestos and the respiratory conditions mesothelioma, lung cancer and asbestosis soon became apparent and the avoidable risks to blue-collar workers and their families outweighed the benefits. It is estimated by the National Institute of Health (NIH) that 11 million people were exposed to asbestos between 1940 and 1978, much of that comes from workplace exposure. Industry employees most exposed are firefighters, construction, shipyard and automotive workers, and asbestos miners. Because those industries are male dominated, men are about five times more likely to develop mesothelioma than women, however there are many instances of spouses and children being diagnosed from secondhand exposure. It should also be noted that port cities and Rust Belt states show higher rates of mesothelioma mortality at two to four times the norm. Because of a long 20-50 year latency period (the time between exposure and noticeable symptoms), 80% of those diagnosed with mesothelioma are 65 or older with an average diagnosis age of 75 for males and 72 for females. (Note these numbers are considerably higher than the average statistic for all cancers above). Please consult a doctor if you are experiencing symptoms and believe you may have been exposed to asbestos, especially if you fall into the high risk categories of occupation, location, age or gender. The good news is, though instances of cancer are on the rise, an overall increase of cancer survival rates, including mesothelioma, is attributed to better prevention, detection and treatment methods. Mesothelioma is a cancer often associated with a late diagnosis and low survival rate. The average life expectancy for a mesothelioma patient is 12-21 months after diagnosis and between 5 and 10 percent of mesothelioma survivors lives at least five years after diagnosis. However, early detection is especially important as there is a strong correlation between the age and stage at which diagnosis occurs and survival. One study showed individuals diagnosed with pleural mesothelioma at the age of 65 lived on average eight months longer than those diagnosed at 75 or older. Similarly, catching the cancer at Stage I rather than Stage IV can add years to your life. Often times general mesothelioma symptoms like chest pain, fatigue, nausea, hoarseness and difficulty swallowing are thought to be the result of other respiratory illnesses, and thus a test for mesothelioma cancer happens very late in the process. Alerting your doctor with knowledge of symptoms and awareness of possible exposure maybe save your life by catching the cancer early. Additionally, diagnostic and treatment options are improving everyday. One way to detect mesothelioma is through a blood test that identifies biomarkers in the bloodstream. New studies have found a biomarker protein called high mobility group box protein 1 (HMGB1) that can amazingly identify those who have been exposed to asbestos and have a high risk of developing mesothelioma, but have not yet done so. Another example is a non-invasive breath test that was recently developed that has a 90% accuracy rate allowing for effective diagnosis at a treatable stage of the cancer. New precision medicine and immunotherapy are seeing early successes in clinical trials. An ongoing study at Baylor University is testing the effectiveness of using immunotherapy, an immune system boosting treatment based on genetics, as a neoadjuvant (before surgery). As with any illness, prevention is the more effective “cure.” Although many researchers and scientists are working hard everyday to find a true cure for cancer, that accomplishment may still be years in the making. Until then, there are steps we can all take to try and prevent a future cancer diagnosis. As the Community Outreach Director at Mesothelioma Cancer Alliance, Emily Walsh builds awareness about asbestos and mesothelioma, an aggressive and rare cancer that affects about 3,000 people in the U.S. each year. MCA is an organization dedicated to providing reliable and current information and resources for those with mesothelioma and their loved ones. “Age and Cancer Risk: A Potentially Modifiable Relationship,” National Center for Biotechnology Information, U.S. National Library of Medicine. “Cancer Prevention: 7 Tips to Reduce Your Risk,” Mayo Foundation for Medical Education and Research (MFMER). “Malignant Mesothelioma” American Cancer Society, Inc.
“Occupational Cancer” Centers for Disease Control and Prevention. “Reducing Your Risk” LUNGevity Foundation. “U.S. Federal Bans on Asbestos” United States Environmental Protection Agency. “Mesothelioma Life Expectancy” Mesothelioma Cancer Alliance. “2016 in Review: Recapping Mesothelioma Research” Mesothelioma Cancer Alliance.